Big narrative decisions, permadeath, and Original Sin 2's combat evolved. I'm getting the gang back together. Lohse, my hero from Divinity: Original Sin 2, is now living life happily demon-free, hanging on the ship The Lady Vengeance with Ifan Ben-Mezd. We're reunited with Malady, my favorite sarcastic half-demon, and about to start a mission to meet up with Fane, the undead wizard. As I start to assemble my squad for the mission, I can't help but recognize the similarity to Final Fantasy Tactics. Some things haven't changed: Divinity is still hard, and its tactical combat is still richly open-ended. Here I am in a fantasy spin-off game, assembling a team of heroes and generic soldiers, by the classes I think will mix best. I take a ranger, whose arrow skills allow them to coat an area in oil and then light it on fire. And I figure having a cleric along to heal the party will be vital, because I pulled through my first mission by the skin of my teeth. He'll be dead within 10 minutes. Some things haven't changed: Divinity is still hard, and its tactical combat is still richly open-ended, demanding you carefully think about every move you make, and then roll with the punches when it inevitably goes horribly wrong. Fallen Heroes is a sequel to Original Sin 2, starring the same cast of characters but scaled down to, essentially, just the combat bits. There's a bit of an XCOM-like meta layer here, filtered through Larian's RPG systems. In between missions you'll click through story and dialogue options, and different rooms on the Lady Vengeance operate as simplified versions of XCOM's facilities. Don't go in expecting a sprawling base-building system, but there are upgrades to make to your ship and soldiers in between battles. Troops will unlock more skills as you progress through the campaign. 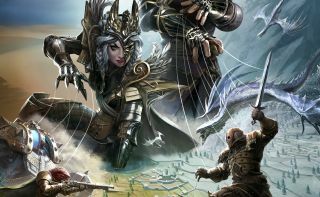 Combat looks a whole lot like Original Sin 2, but there are a few major changes for this game—if you've played as much Divinity as I have, that means you'll probably have to rewire your brain's strategy center a bit. In OS2, every character in battle slotted into the turn order somewhere based on their stats, but this time around you take a turn to control your entire team, and then the AI does the same. This means that the number of tactical decisions you can make at any one time explodes enormously. You need to consider all of the abilities of your entire team and in what order you should use them. For example, in one fight I brought my heavy-hitting polymorph in close to deliver a melee hit on an enemy, dropping them down to low health. Then I realized I could have attacked with my archer first, coating the enemy in oil and then lighting them on fire. But if I used those abilities now, I'd end up hurting my own soldier, too. I spent whole minutes clicking between the members of my team, thinking about their skills and what order I should use them in. And my demo was early in the game, with only a small handful of skills for each class. As you progress through Fallen Heroes you'll unlock more skills for your heroes and your basic soldiers in each class, which is an important distinction from games like XCOM. When my cleric died in my mission to rescue Fane, he was permanently dead, but in the next mission I could recruit another generic cleric with the same suite of abilities. There are also unique recruitable characters called "veterans" who can die permanently as well, and I lost two of them trying to help Fane get his research and escape to the Lady Vengeance as we were ambushed by the Black Ring. It was not a great start, but it reminded me of just how quickly everything can go to hell in Divinity when the enemies I'm up against have access to all the same skills I do. And they use them. Larian's Swen Vincke says you will be able to resurrect your troops later in the game, but that ability won't come quickly or easily—it'll be a big deal. In the meantime, you'll probably want to save often, or accept that your troops are going to die a lot. Vincke told me a large number of Original Sin 2's skills have been reworked and rebalanced for the new game, and there will be new skills to learn, too. Combat encounters are being designed similarly to the ones in Larian's RPGs, which means the win conditions are going to be a bit more story-driven than you'd expect from the typical tactics game. In the first mission I had to destroy some ballistas that were pummeling the Lady Vengeance before she sank, and in the second I had to guide Fane to several points on the map to hunt for his research, then get him to an extraction point. In both missions reinforcements kept spawning in, forcing me to accomplish my objectives before I was overwhelmed. Vincke said they won't overuse that mechanic, and I hope that proves to be the case, because it was a bit of a grind having new waves of enemies pressing in on me every three turns. But it did push me to think creatively instead of trying to kill every enemy. In Fane's case, I used one of the two artefacts I was able to take with me on the mission—powerful, global items that anyone in your party can use—to set up a pair of teleporter pyramids and jump him halfway across the map to the extraction point. I also made a classic Divinity mistake of putting one pyramid right next to a ladder, blocking one of my other troops from teleporting, too. She would've been dead meat if I didn't have Fane escape that turn. Two player co-op support is back. Even though this isn't a full-on RPG, your decisions will impact the story, and especially how the characters respond to you. Lose their trust and bad things will happen. If you and your co-op partner are making different decisions, your followers will side with whoever's decisions they like more. There's a new "surface" type called sulfurium, and any kinetic force applied to it will trigger the surface, flinging characters or objects away and dealing damage. The Lady Vengeance can serve as your artillery. You'll be able to summon it in battle. Though I didn't see this part, you'll be able to position your characters before starting battles. The game is a co-production with Expeditions: Viking developer Logic Artists. Fallen Heroes is out this year.